You will want to save this spice recipe for other meats, too. Yum! Dovetailing tip: Cook 2 additional chicken breast halves. When cooled, slice and store to use for Meal 2, Chicken & Strawberry Cobb Salad. Mix all your spices together and coat your chicken breasts with the mixture (just so you have a light coating, you don’t have to use it all). Heat a grill pan on high. 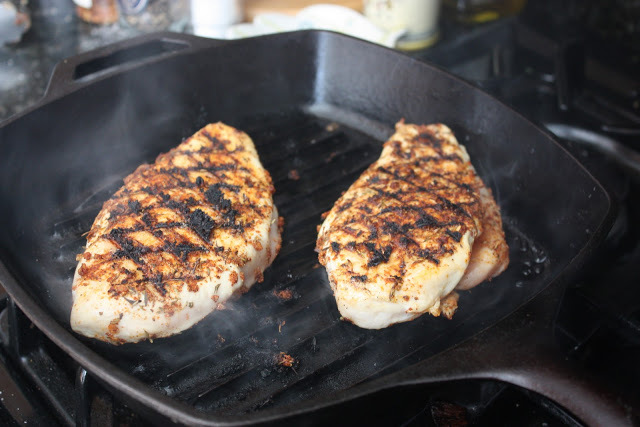 Spray with olive oil or cooking spray and put chicken breasts on at a diagonal. After about 2-3 minutes, turn chicken (not flip) to the opposite diagonal to create the X pattern on my chicken and let sit another 2-3 minutes. Spray the top of the chicken breasts and flip. Repeat on the other side until chicken has had about 10 minutes of cooking time. Time varies based on the size of your chicken–you know it’s done when you press the thickest portion and it feels pretty solid (or you can cut into it).